At 17, Maya is anorexic. She has shrunk from 58kg to 35kg in just three months. She looks bony and her skin is pale and sallow, her face gaunt and ghostly, her eyes sunk deep into the hollow of their sockets. Maya is a shadow of her former self—a sprightly, full of beans, attractive teenager who loved singing. Now she is always irritable—at that extra chapati or slice of pizza she ate. Even when she looks at her shrivelled frame in the mirror, she thinks she is looking at someone who is fat. Whenever her worried and tense mother forces her to eat, Maya pretends, in reality looking for ways to hide that extra slice. Maya is anorexic. She suffers from the serious disorder anorexia nervosa because she has these three symptoms: a refusal to maintain healthy weight, an intense fear of gaining weight, and a distorted body image. Extreme calorie restriction causes extreme nutrient, protein and omega fat deficiencies which in turn lead to lacklustre hair and skin and brittle nails. Cavities and gum disease occur because of calcium deficiencies. Anorexia is most prevalent among girls and starts in early adolescence. In India the incidence is clearly on the rise, but it is difficult to estimate the extent as several cases go unreported—rapid weight loss and unusual withdrawn behaviour in teenage girls should put the family on high alert. 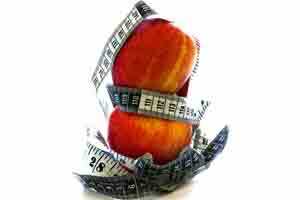 An anorexic starts with a regular diet and exercise programme for weight loss. Somewhere down the line the behaviour becomes obsessive and the mind, disordered. Calorie restriction becomes extreme and it isn’t uncommon for anorexics to exercise for 3-4 hours because they feel they are always overeating. All this typically leads to rapid weight loss, with the anorexic losing as much as 20-25% of total body weight in a few months. This rapid weight loss disturbs fluid balance and fluid depletion lowers blood pressure, leading to muscle cramps, fatigue and dizziness. Anorexics feel cold easily and lack the ability to maintain their body temperature when the surrounding temperature varies during the day. Anorexics, because they are so thin, lack the insulating layer of body fat that regulates body temperature at 98.6 degrees Fahrenheit; some need to wear sweaters all the time to feel comfortable. Over time, as starvation progresses and the body’s defences breakdown, anorexics grow fine, downy, white hair on their face and body called lanugo. Lanugo is a sign that the body’s natural defences are at work. The anorexic needs urgent help, especially from the family. Dealing with a disordered mind, one that does not understand reason, can be nerve-racking. Mothers and family members of anorexics suffer the ripple effects of anxiety and depression themselves. Utter frustration makes them reactive and emotional. The feeling of helplessness prompts mothers to nag, shout and belittle their anoxeric child, then turn turtle, feel sorry and empathetic. Mixed emotional messages make matters worse and an anorexic continues to feel lonely and misunderstood. The key to treatment is for the mother or a significant family member to first put themselves in the mind of the anorexic and see the world as they do. With the strength of this bond, they can then seek intervention from a psychologist and nutritionist. A good strategy to use is to focus on nutrition as a supporting activity for achievement, such as excelling at college or school work and projects or extracurricular activities. All these activities require nutrition for brain function and creative thinking. Sit them down, chat with them matter-of-factly, identify the foods that will help improve mental stamina and not make them gain weight easily, like skimmed-milk paneer (cottage cheese), seafood, tofu, egg whites, green leafy vegetables, and chart out with them a plan for eating such foods. Once you have won them over you can gradually add other foods like grains, vegetables such as sweet potato, potato and corn that are high in starch. Work out a plan of action together and win their confidence first. Focusing or even talking about weight gain will set them back several steps. As levels of healthy nutrition in the body increase, so will the levels of vital nutrients like vitamins A, D and B-complex, and healthy omega nutrients. This will improve brain function, mental clarity and emotional stability, which in turn can go a long way in bringing order to the disorderd mind of an anorexic.